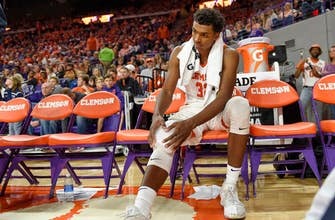 CLEMSON, S.C. (AP) Clemson forward Donte Grantham will miss the rest of the season with a torn anterior cruciate ligament in his right knee. The 20th-ranked Tigers are trying for their first NCAA Tournament berth in seven years, but the loss of Grantham is a major blow. The 6-foot-8 senior was second on the team with 14.2 points and 6.9 rebounds per game. Grantham was driving to the basket during Clemson’s win over Notre Dame on Saturday when his right leg appeared to buckle after getting fouled from behind. An MRI revealed the torn ligament. The Tigers (16-3, 5-2 Atlantic Coast Conference) announced Grantham’s injury on Sunday.